Hoshana Raba Evening of Learning. To open the new year of the Rohr Family Parashat HaShavua, the Menachem Begin Heritage Center is sponsoring an evening of learning on October 8, 2009, for Hoshana Raba. The three main lecturers for the year will each present lectures that evening, including Dr. Shelly Goldberg, Mr. Baruch Barzel and Dr. Ido Hevroni. The evening will conclude with Yonatan Razel who will sing religious songs in the spirit of Hoshana Raba. This event is free and is in Hebrew. First Parashat Hashavua with Dr. Ido Hevroni. The English version of the Menachem Begin Heritage Center is live. The site is still under construction, but we invite you to visit the site HERE and see what's new and what's happening. As part of our advertisement campaign to increase attendance at the museum during Sukkot, we have a full billboard size poster near the Begin Center informing everyone of our extended hours. 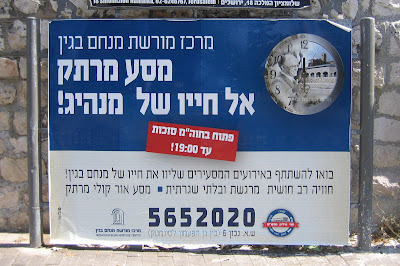 Additional advertisements are also posted several other busy intersections around Jerusalem. The sign announces "An exciting trip through the life of a leader!" and that we have extended our hours until 7:00pm each evening of Chol HaMoed Sukkot. We hope to see another week of stellar museum attendance numbers. The Hakhel Festival has been in existence for the past thirteen years and for the first time, the Begin Center has been approached to participate. The Hakhel Fesitval is an event focusing on Jewish identity and Israeli culture. This year the Festival will be at Sapir College in Sderot on 4 October. The Education Department of the Begin Center will facilitate a workshop for participants titled "Between Judaism and Democracy". The Begin Center will also be represented with its own information booth at the Festival. Their English language website is HERE. A sculptress, Bella Strifler, and a painter, Leora Benkel, have launched an art exhibition at the Begin Center. The theme is "Fluctuations" and the works explore the dialogue between open space and matter using wheel elements and utilizing the symbol of a clock as part of our lives. The exhibit will be on view until October 19. WOULD YOU LIKE TO DONATE TO THE BEGIN CENTER? Please direct any inquiries to development@begincenter.org.il.